I always look for investing opportunities which are, or can be, easily achievable to me. By that I mean that they are within my reach of limited money to invest. I started investing in Lending Club in 2012 and I was very successful in it. Yes, I was using a loophole to avoid default notes since I was not given an opportunity to participate in a more detailed verification process or at least see it and its results. Thus you ended up buying notes without any possibility to react to bad notes unlike with options where you can roll them and get better. But that is past. Here you can review my reasons for no longer investing in Lending Club. Lately, I was thinking I may return to the club and start investing again, small amounts, maybe $25 every month and invest in A or B notes only. To my surprise, when I opened my old Lending Club account and tried to browse available notes to invest, there were no A nor B notes! The system only showed 70 notes total! And none of them I would consider to invest in! Quite a shock to me as I remember when I was investing in 2012 – 2013 there were thousands of notes to choose from. It was almost impossible to have nothing to choose from. I tried to search other bloggers what they posted recently about investing in P2P and most of the posts were from 2015 or 2016. Nothing recent! 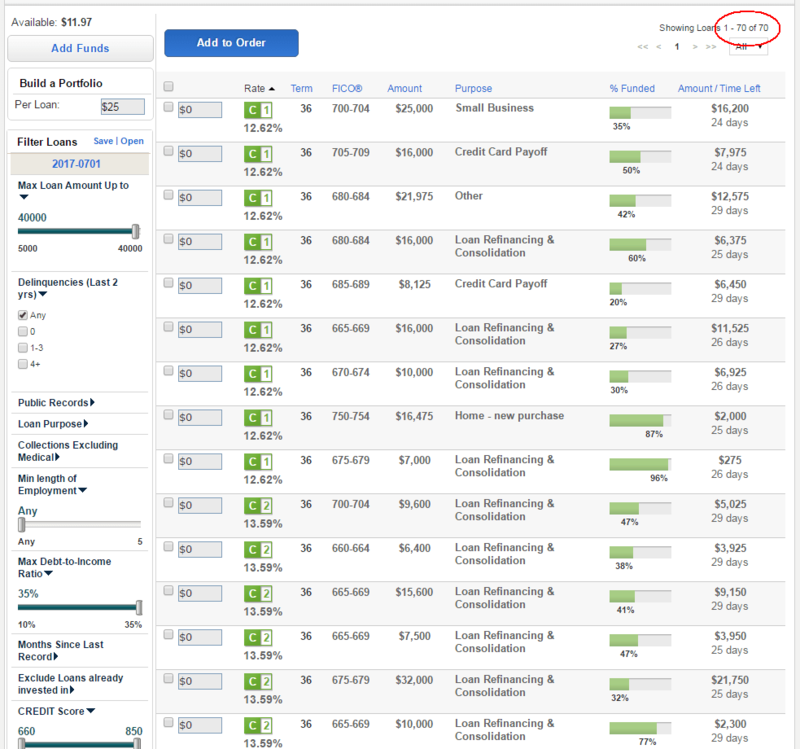 Is Lending Club dead then? 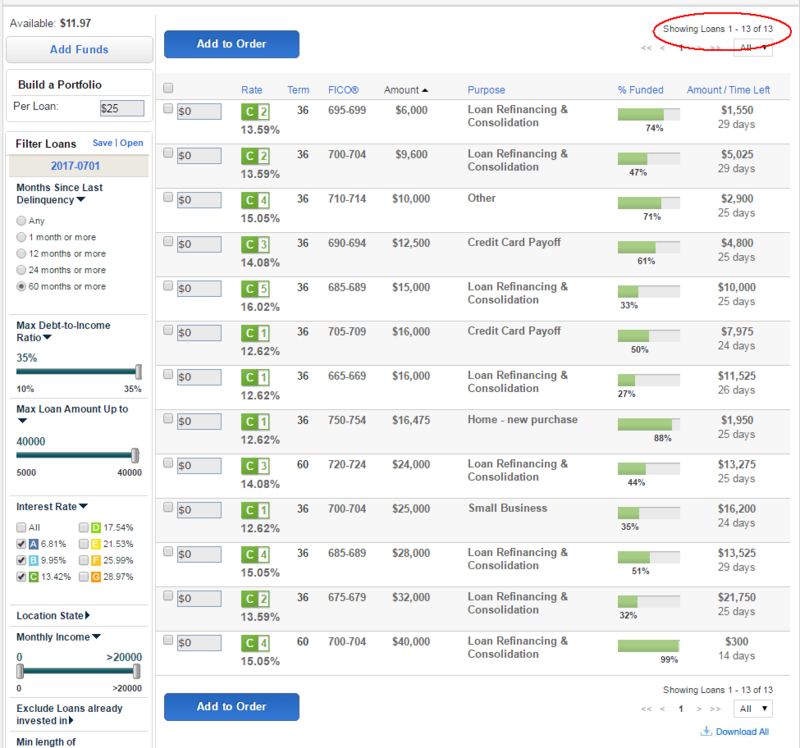 I found a recent article reviewing Lending Club learning that today, if you want to start investing in Lending Club, you need at least $1,000 dollars account. However, this rule doesn’t apply to the old accounts like mine. There fore I am planning to give Lending Club a new try and start investing again. 6) I will buy a new loan every month first business day. Let’s see how this is going to work. People (and Lending Club) keep saying that you have to diversify over a 100 notes in order to be successful. Thus they recommend you to invest at least $2,500 dollars to reach such diversification. But I think they do not take into account time and spreading that diversification over time. It doesn’t matter whether I buy 100 notes now and 20 of them default within a month or I buy 1 note every month and it would take me 100 months to reach $2,500 limit they require while 20 notes over 20 months will still go below. I will lose that money either now or later. Thus it doesn’t matter whether I lose them now or ten months later. Here you can review all my posts about my experience with Lending Club. I’ve noticed the same thing. Too many D&E loans and not enough A&B loans. My returns are still over 6% after write-offs, so I’m not complaining. I am considering collecting my cash instead of auto investing though. I’ll see. I want to start again and build small account again from scratch similar way to Kiva.